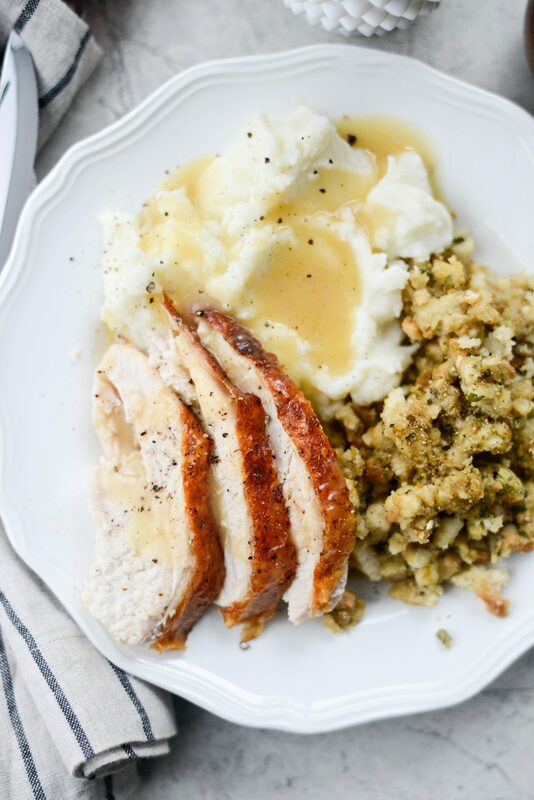 This Butter Roasted Whole Turkey Breast takes only a fraction of the time in the oven and yields a deliciously moist turkey. 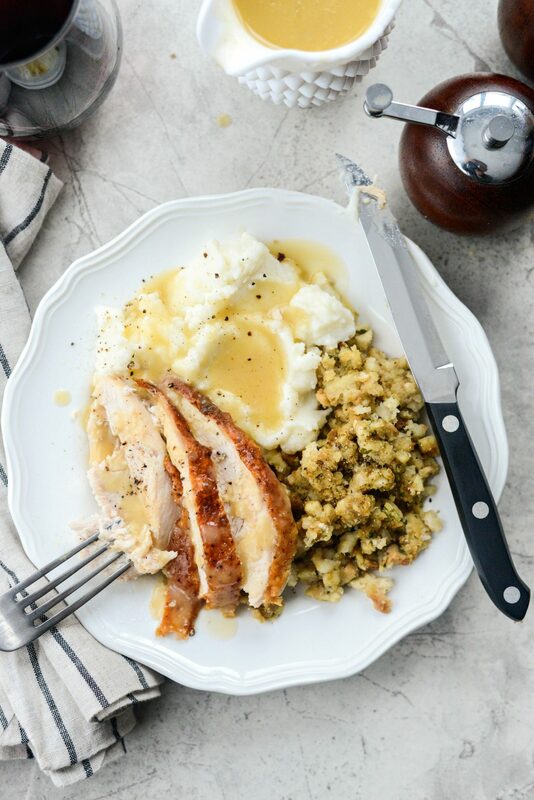 While it rests, whip up the easiest turkey gravy ever. 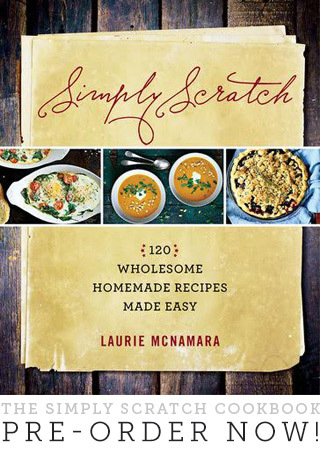 This year, Thanksgiving dinner can be a breeze. Today we are roasting a whole turkey breast. Yes! A whole, bone-in turkey breast because a) white meat and b) because it only takes a few hours versus several hours when roasting an entire bird. Truth be told, I do love both light and dark meat. However I don’t love the time it takes to roast a whole turkey. 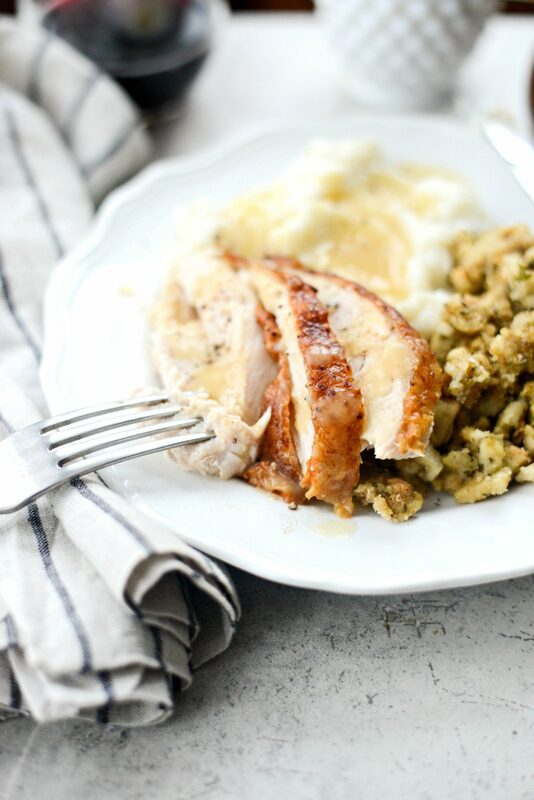 As you’ll see, this recipe is crazy easy and will have your home smelling like the holidays in under 3 hours. 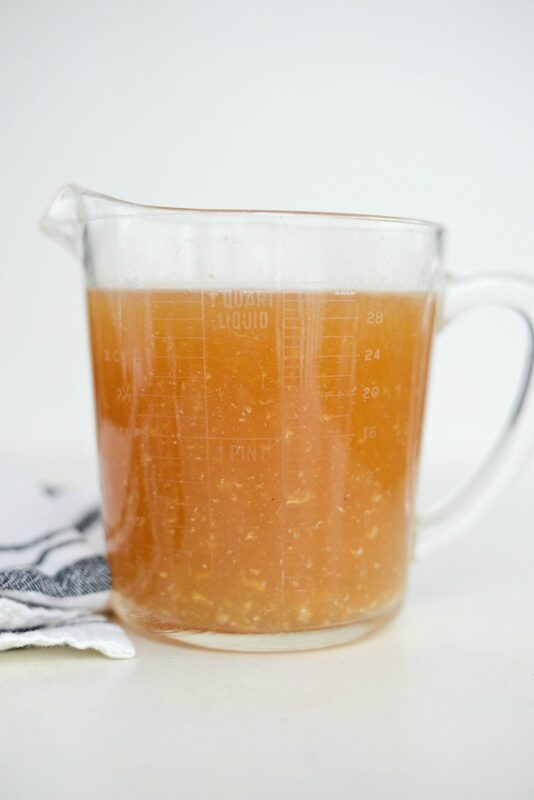 Plus I’m showing you how I make the easiest gravy ever. AND there’s still crispy turkey skin. The perk of being a food blogger this time of year is TWO thanksgiving dinners. Note, this is not what my typical Thanksgiving plate looks like. 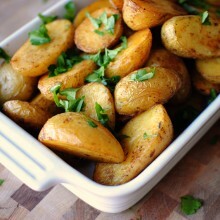 Usually there’s a few more spoonfuls of about 4 other of side dishes, plus rolls and extra gravy. And as my mother-in-law would say; “my eyes are bigger than my stomach.” This plate  is a gross understatement. Back to the turkey. Gah! 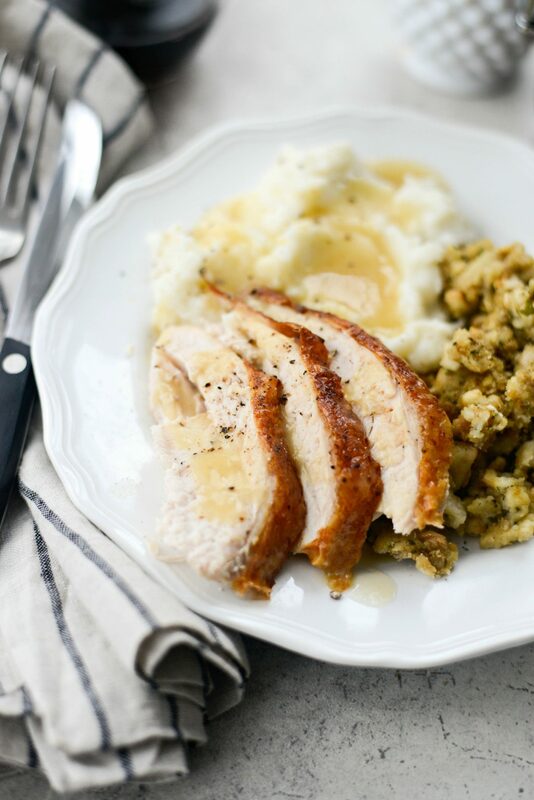 Butter roasted turkey is amazing and so SO moist and flavorful. Which isn’t the case sometimes when roasting a turkey. But trust me, the answer is (and will always be) butter. 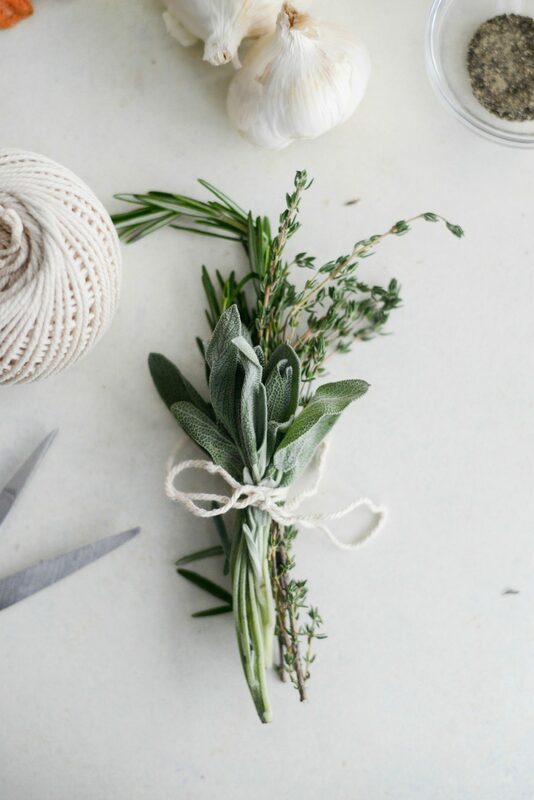 Here’s what you’ll need; 4 to 6 sprigs thyme, 2 small bunches sage and 2 sprigs rosemary and some kitchen string. 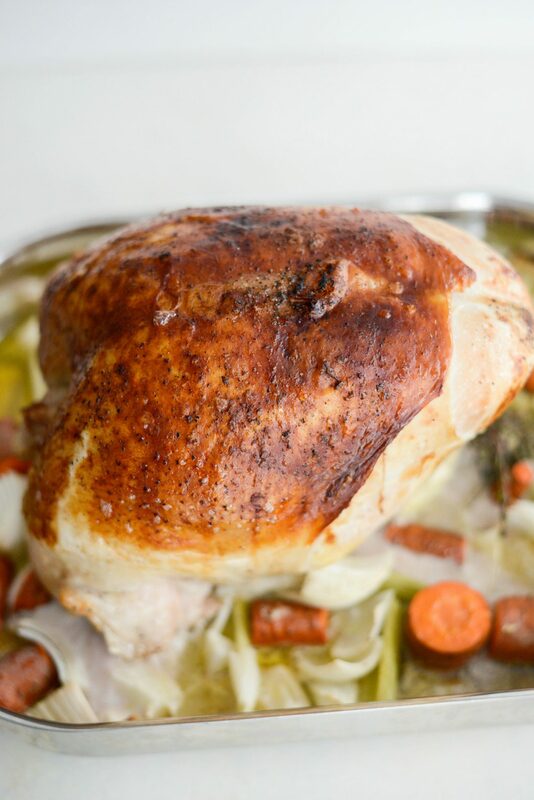 Also, 2 large carrots, 4 (short) stalks celery, 1 large onion, 2 medium heads of garlic (3-1/2 to 4-1/2 pound) bone-in turkey breast (thawed) 1 stick softened unsalted butter, kosher salt and black pepper. 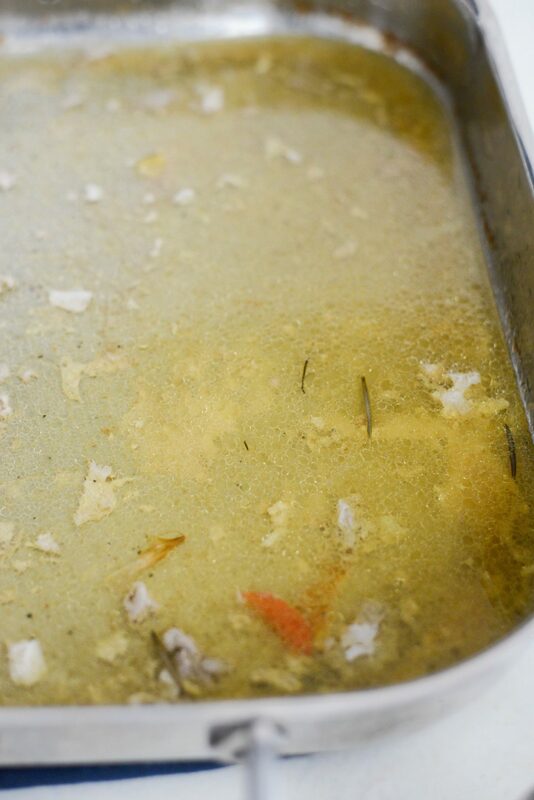 For the gravy, just some turkey drippings, 4 to 6 tablespoons flour, turkey broth or stock. Note: I bought my whole turkey breast frozen. Once I got home, I placed it (still wrapped) in a pan, like the one above, and placed it into my fridge for 3 full days to thaw. 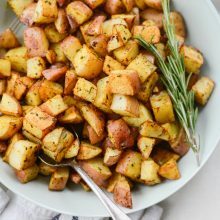 The morning of roasting, pull it out of the fridge 1 hour to 1-1/2 hours beforehand and set it on the counter to take the chill off. Next, bundle the fresh herbs together and tie well with kitchen string. 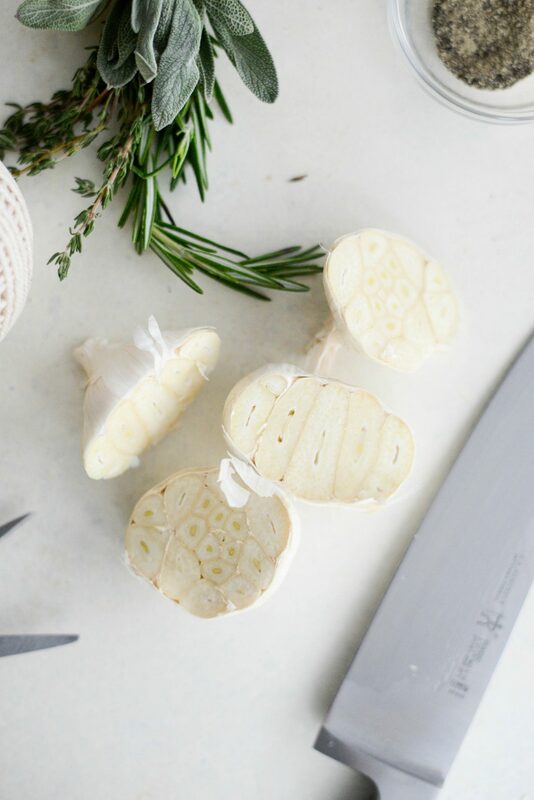 Then cut two medium-ish heads of garlic in half horizontally. 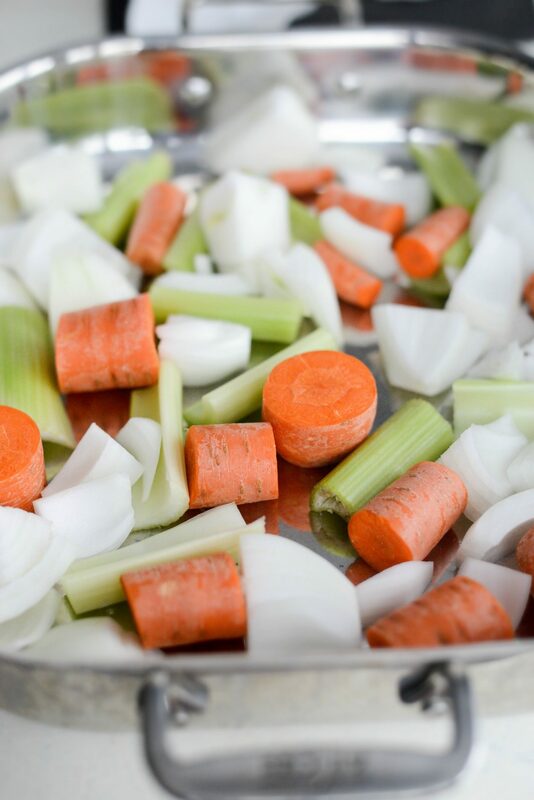 In a deep sided roasting pan (I’m using my lasagna pan) scatter the chopped carrots, celery and onions in an even layer. Next, move your oven rack to the lowest position and preheat to 325°. Then using paper towel, blot dry the exterior and the inside cavity of the turkey, well. Next, use your fingers to get under the skin and pull it from the flesh. 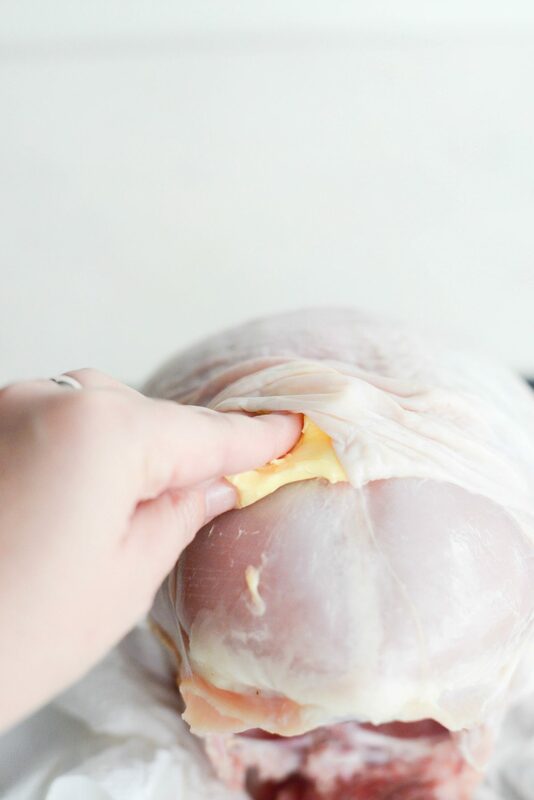 Then rub the butter underneath the skin and then around the exterior, and inside the cavity of the turkey. 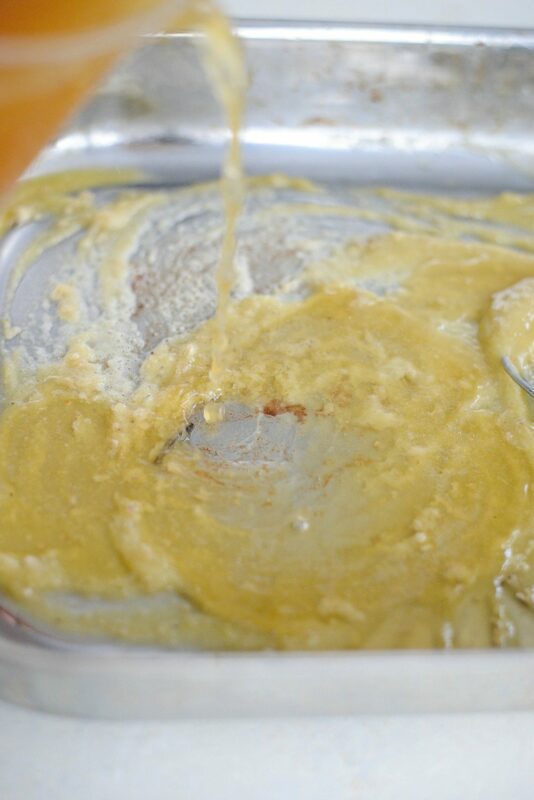 Make sure your butter is SUPER soft (not melted) otherwise the butter will not spread easily. Then season the exterior and inside the cavity, generously with kosher salt and black pepper. 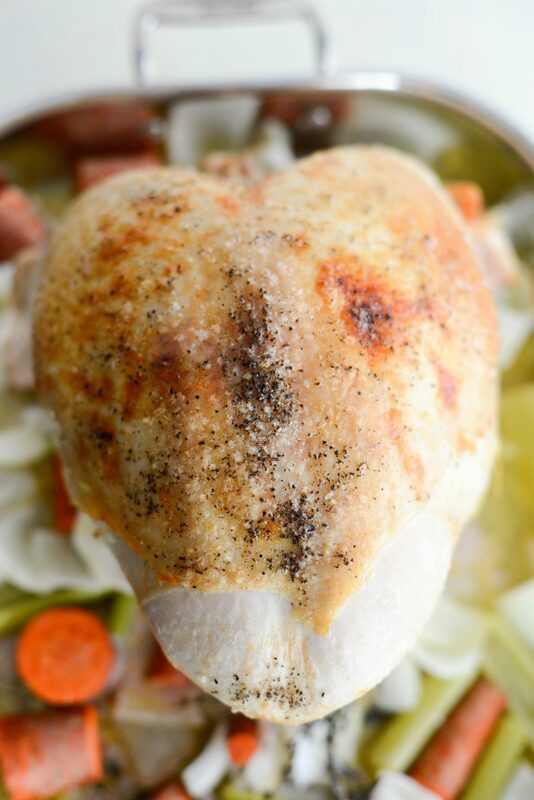 Place the turkey breast onto the bed of vegetables and stuff the garlic halves and herbs inside the cavity. Slide the turkey into your preheated oven and roast for 1 hour. 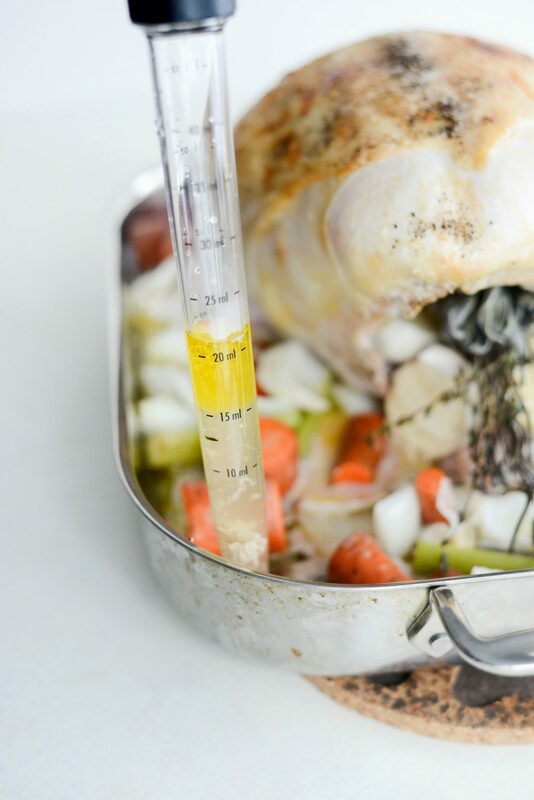 Then remove, and use a turkey baster to pick up the butter/juices in the bottom of the pan and squeeze over top and inside the cavity of the turkey. Return the turkey to the oven to roast for an additional 30 minutes. Then repeat this step twice more or until the turkey skin is deep golden, crispy and a thermometer reads 160° when inserted into the thickest part of a breast. Look at that turkey skin! Carefully transfer the turkey breast to a carving board and cover with foil. 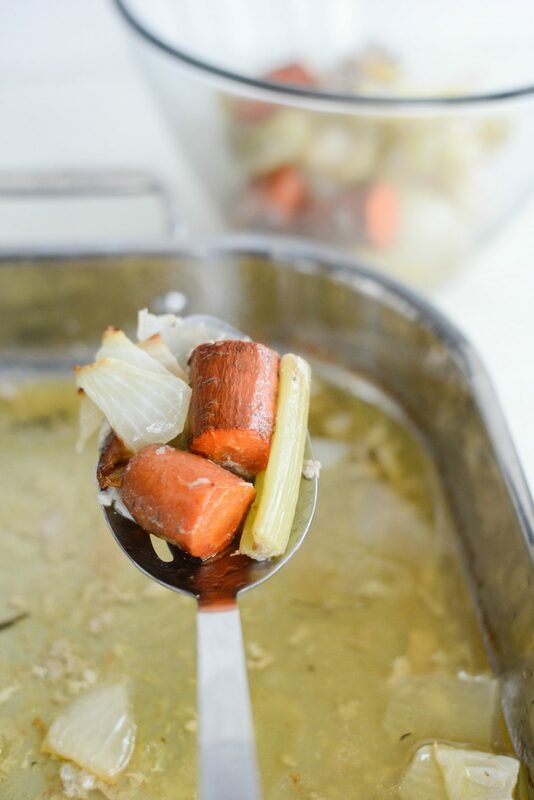 Allow to rest for at least 20 minutes which is the perfect amount of time to make the gravy. 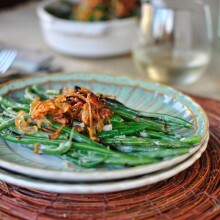 Use a slotted spoon to remove the vegetables to a bowl and discard. 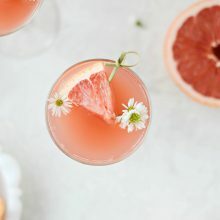 They have done their job in flavoring the pan juices. Next, pour the pan juices into a fat separator. Once separated. 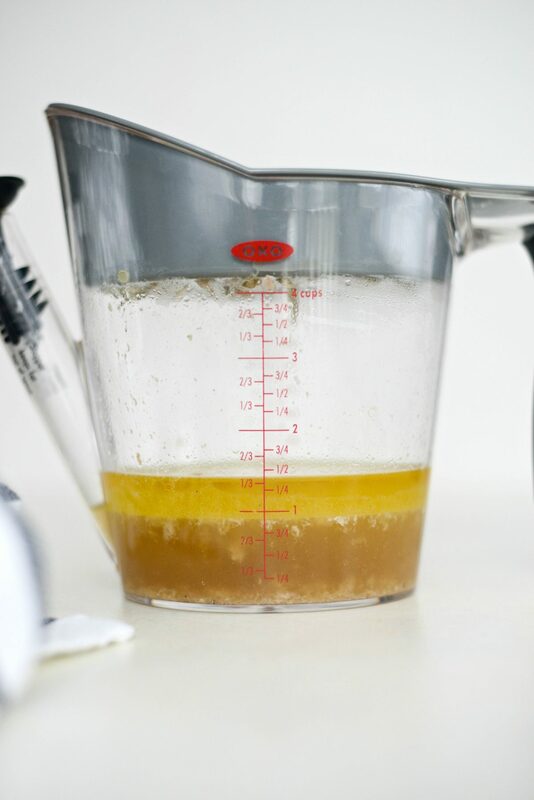 Pour the juices into a separate measuring cup and add enough turkey stock or broth to make 4 cups. Then add only 1/4 cup of the turkey fat back to the roasting pan. 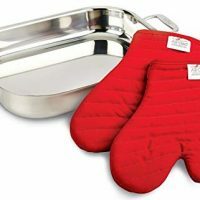 Place the roasting pan on a large burner and heat to high. Whisk in enough of the flour to make a smooth paste. 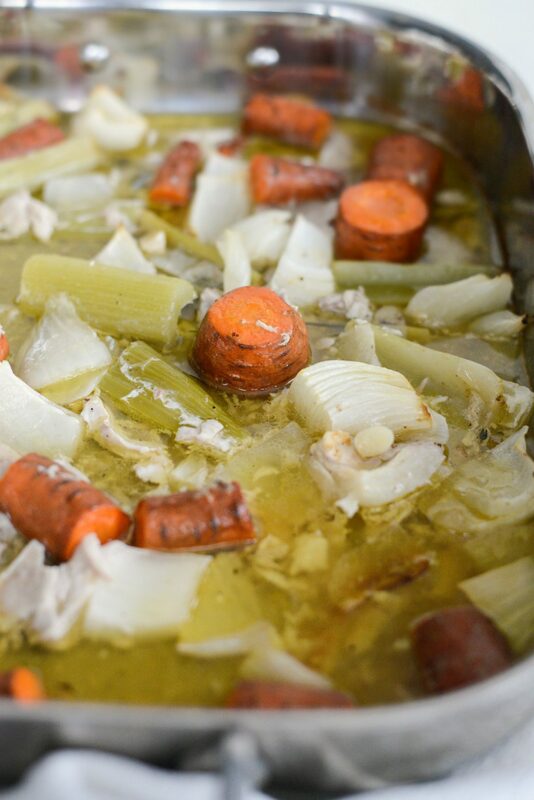 Cook for 2 to 4 minutes, then pour in 4 cups of broth/juices into the pan and bring to a boil while whisking often. Once thickened, strain (or don’t) and serve in a gravy boat. 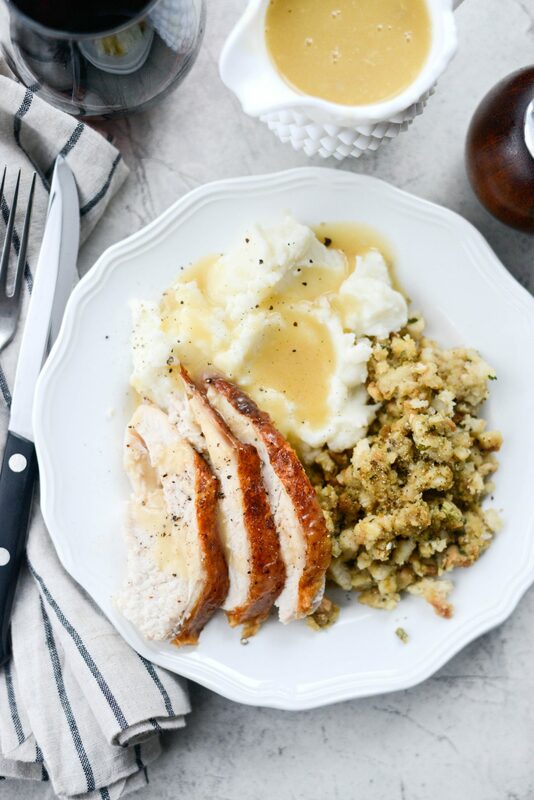 All that’s left to do is slice and serve the turkey with your favorite sides, like; green bean casserole, corn casserole, candied sweet potatoes and dinner rolls! Enjoy! 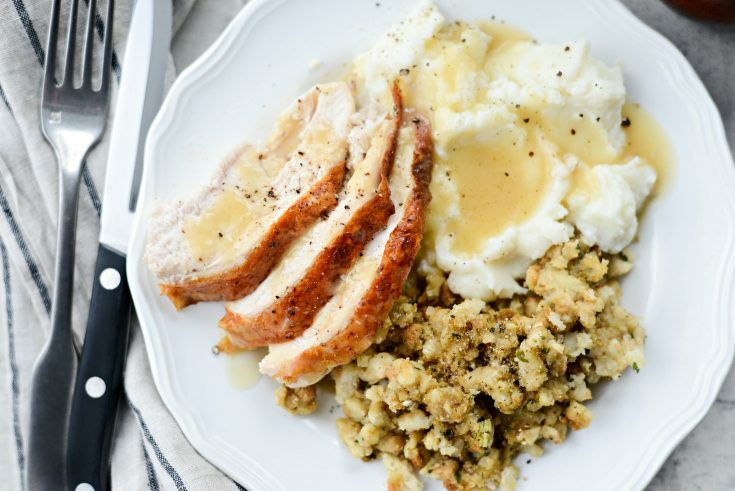 And if you give this Butter Roasted Turkey recipe a try, let me know! Snap a photo and tag me on twitter or instagram! A whole, bone-in turkey breast is rubbed with butter, seasoned and stuffed with garlic and herbs and roasted on a bed of vegetables. Set your turkey out on the counter 1 to 1-1/2 hours prior. 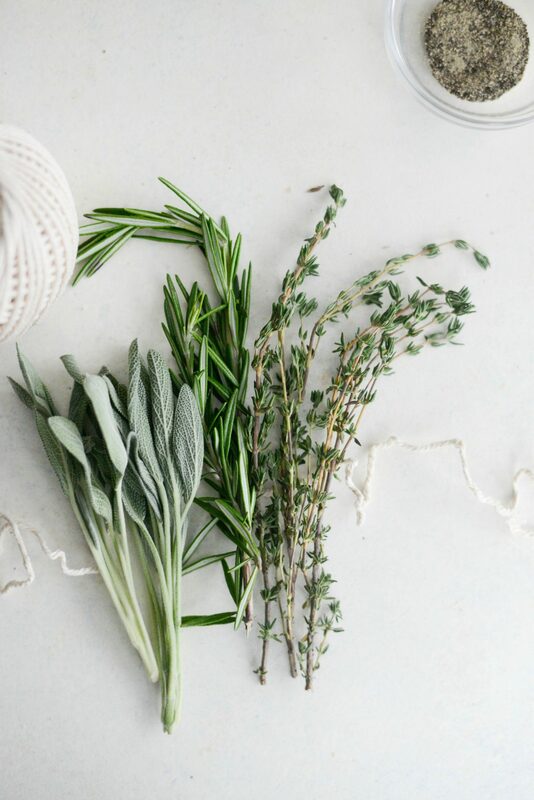 Tie the sage, thyme and rosemary with kitchen string and cut the garlic in half horizontally. Then preheat your oven to 325° and move your oven rack to the lowest position. 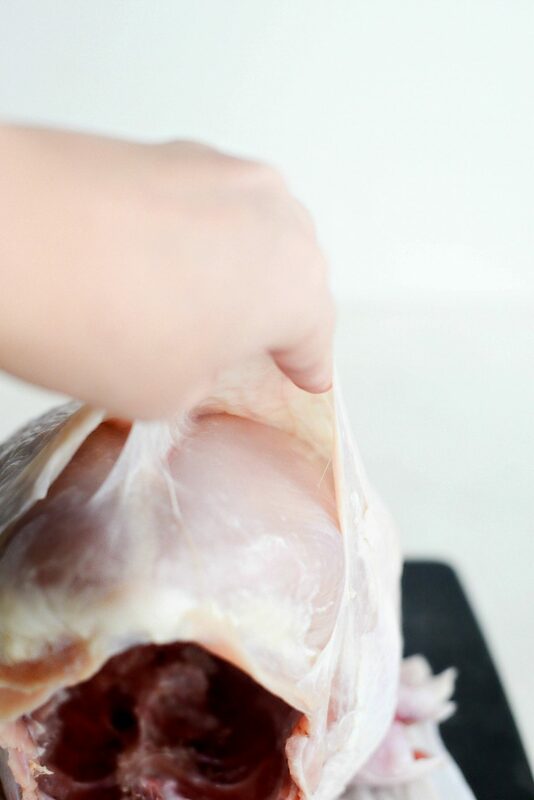 Use your fingers to separate the skin from the flesh of your turkey. 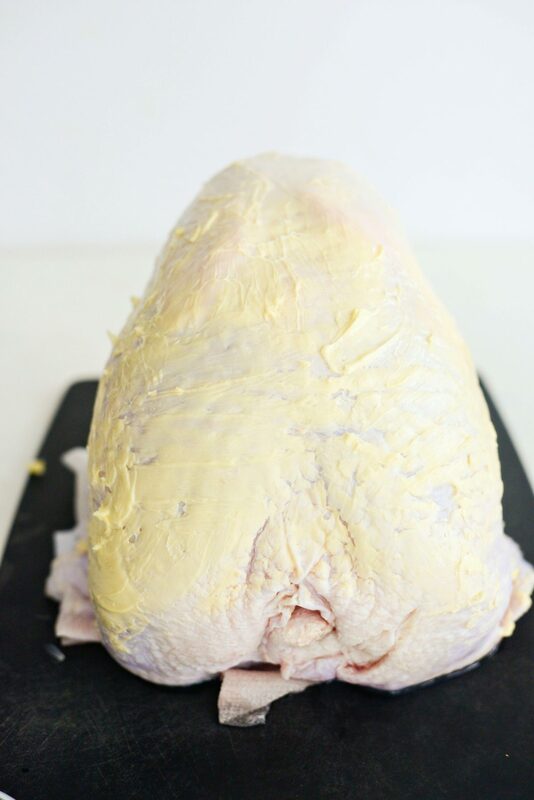 Using softened butter, massage it under and over the skin of the turkey, as well as the cavity. Generously season the outside and inside of the cavity with kosher salt and freshly ground black pepper. 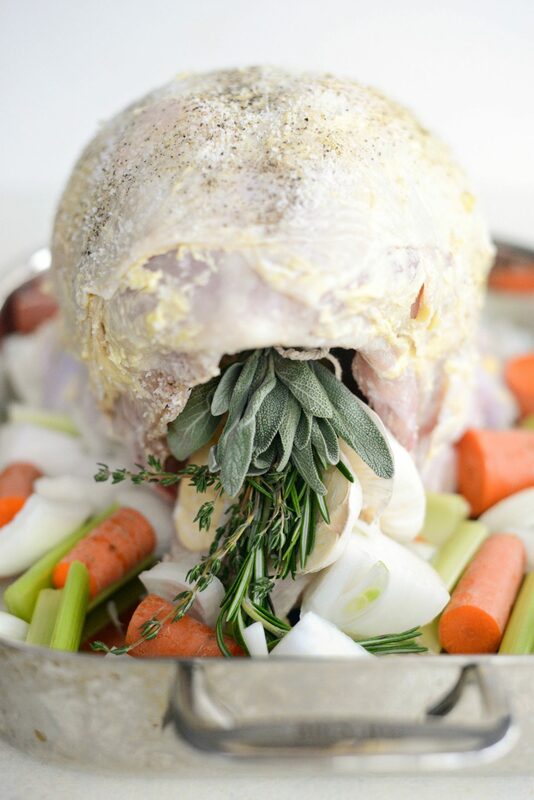 Place the turkey onto the vegetables and place the garlic halves and herb bundle inside the turkey cavity. Roast for 1 hour. Remove and baste top and inside cavity with the pan drippings before returning back to the oven for another 30 minutes. 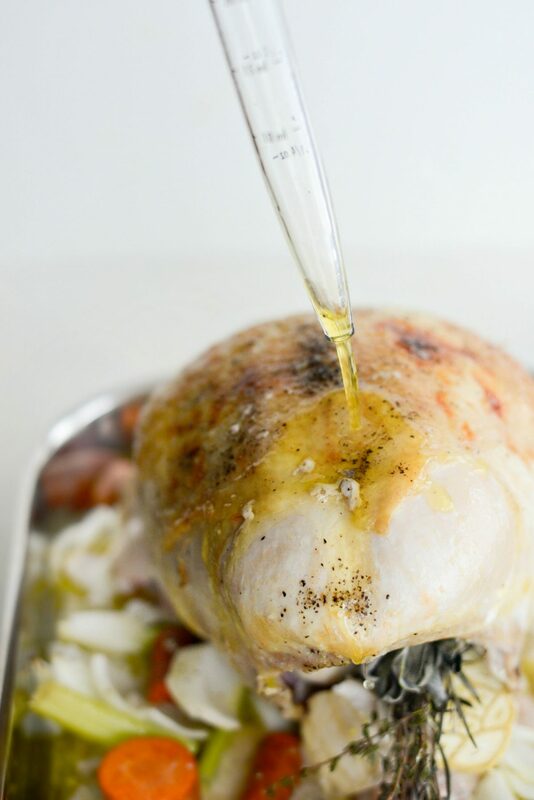 Do this 2 more times or until the turkey reaches 170° when a thermometer is inserted into the thickest part of the breast. 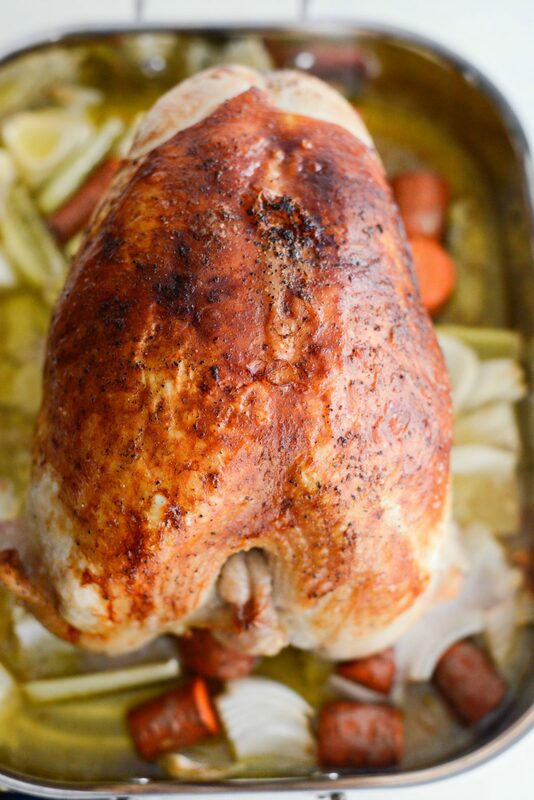 Total roasting time should be around 2 to 2-1/2 hour depending on the sized of your whole turkey breast. 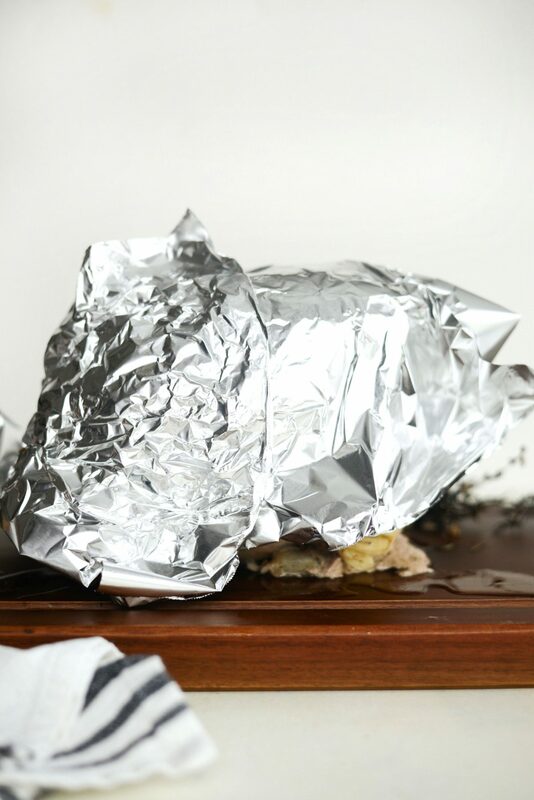 Carefully transfer the turkey breast to a carving board and cover with foil. 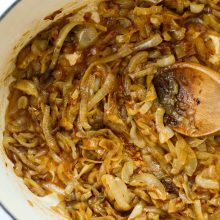 Use a slotted spoon to remove the vegetables and discard. They have done their job. Pour 1/4 of the fat (discarding the remaining) back into the roasting pan and heat on high. Whisk in enough flour to make a smooth paste and until a rich brown color (time will depend)*. Continue whisking while pouring in the 4 cups of turkey broth/pan juices. Season with salt to taste. 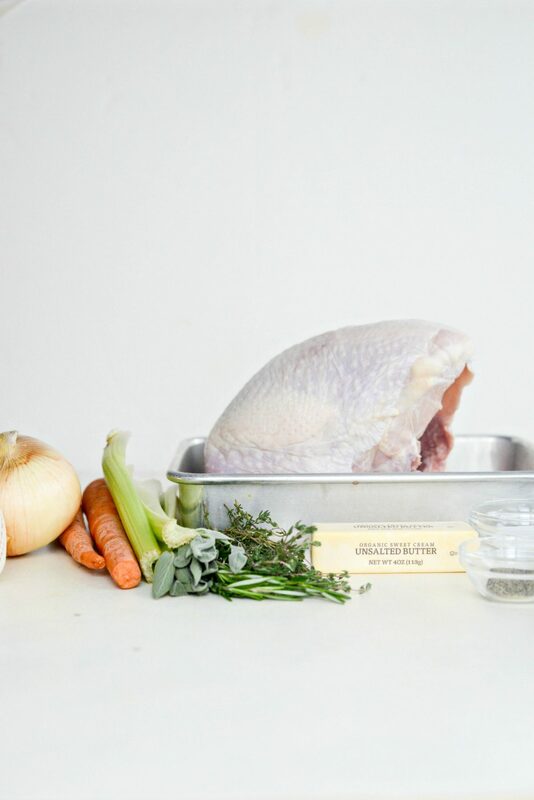 TO THAW: Place the frozen turkey (still wrapped) in a pan and place it into your fridge for 3 full days to thaw. 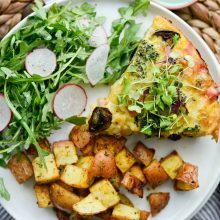 The morning of roasting, pull it out of the fridge 1 hour to 1-1/2 hours beforehand and set it on the counter to take the chill off. If theres still a few ice crystals, that's normal. Also, keep in mind, the time will vary depending on size of turkey. *FOR THE GRAVY: due to lighting issues, I had to rush the gravy (story of my life) so the color isn't as deep as I would like it be - still delicious though! For a darker gravy, know that the longer you cook the roux (butter/flour mixture) the deeper the caramel color. 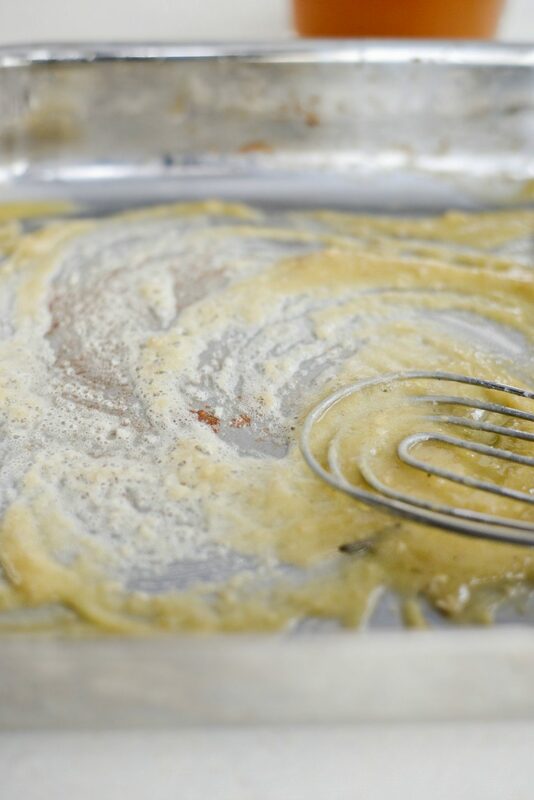 Continue whisking while pouring in the broth/juices. Seriously I need to make this! Like right now and on Christmas. My turkey didn’t turn out on Thanksgiving so I need to redeem myself and this looks like I totally can. And delicious!! But where to I find a turkey that looks like that!?! With no legs! Lol.. Do I just cut the legs off? Hi Elizabeth! You can do it!! 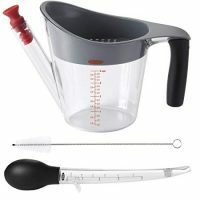 Most major grocery stores carry them! Just look for “Whole Turkey Breast” on the label. Enjoy!